Anyone who has written or read a series of crime novels will know that the format comes loaded with both pleasures and pitfalls. By the time I wrote Kill and Tell, I had been down the road three times with the second, third and fourth in the Staffe series of novels. As writers, we have to convey such information in an oblique way so the characters’ back-stories become apparent in a seamless fashion, woven into the action of the main plot. The reader who is new to the series will be intrigued but hopefully not flummoxed by what has gone on before. It’s a precarious line to tread but I always try to err on the side of pace and economy. Readers can be trusted to fill in the gaps. Another challenge is to take the reader to new places with each book, both in terms of the character development and the milieu that the book occupies. Defamiliarising the world of the series is important for the writer as well as the reader and in the Staffe series; I try to operate on at least three fronts with each book. Firstly, there is the main plot, the central crime around which the main action develops. I also like to address a theme or social issue in each of the books and sometimes this can be a historical event such as the Battle of Cable Street in Kill and Tell or the Spanish Civil War in Death in the Sun; or it might be an exploration of a social issue, such as infertility and the right to life, in Pain of Death. Thirdly, I aim to develop the character of at least one of the main characters in a significant way. In Kill and Tell, DS Pulford is on remand for allegedly killing Staffe’s assailant from an earlier novel. This directly affects Pulford, of course, but also has an impact on Staffe and Chancellor in terms of their approach to law enforcement and the notion of justice. It is these wider reaches of the constituent novels within a series that produce rewards for both reader and writer that stand-alone novels might struggle to achieve in that they have less space within which to develop. A series can drill deeply into the corner of the world where the action takes place, and the characters can be undressed more thoroughly, more slowly, in a way that mirrors life. Of course, the difficulty for the writer is that not all books in the series are conceived at the outset. Things change. Our characters behave in unexpected ways according to the challenges we present to them. The series can take unexpected turns, but that it a pleasure as well as a pitfall. There are several things about Staffe that maybe I would have done differently in the first book, had I known what I know now. But life’s not like that. And as for Staffe and the direction he is going in? From the outset, I had a clear view of where I wanted him to end up in the series and we are getting close to the end now. Anyone who has read the books will know that he is driven to bring to justice the man who murdered his parents. The events of Book 6 take him closer to facing up to Santi Extbatteria, the ETA terrorist who made and planted the bomb that killed them. Will there be a book 7 and a book 8? Certainly the former, but I have great admiration for Mankell and what he did with Wallender and I don’t think this is a series that will go and on. I want the pleasures without the pitfalls, but that is easy to say, I guess, and we all know great crime writers who have found it impossible to break free from the deep joy a series of novels can offer. 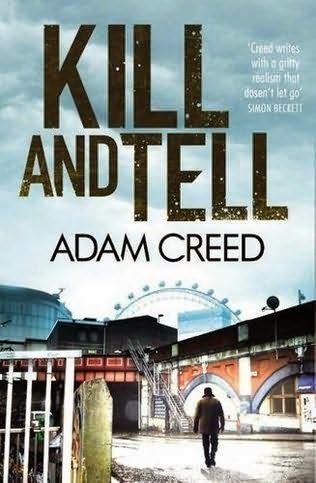 More information about Adam Creed and his work can be found on his website. You can also follow him on Twitter @damcreed and find him on Facebook. Also read the Shots' book review. A reformed Sicilian criminal, Carmelo Trapani, has been kidnapped and his search for the aged Carmello leads Staffe all the way back to a terrible act at the Battle of Cable Street. Meanwhile, Staffe's own loyal servant, DS Pulford, is in Pentonville awaiting trial for the murder of Jadus Golding, the very man who attempted to murder Staffe, leaving wounds from which Staffe is still recovering and it suits some in the hierarchy to see Pulford go down. Can Staffe save Carmelo without leaving Pulford to the political vultures? As he battles find the man who murdered his own assailant, pressures also mount from within and Staffe's heart falters - in every way. His job is on the line and when he least expects it, his own past puts a gun to his head. Fascinating how the novel contains three fronts, two of which distract a reader from the main plot. This is tricky because some readers will skip over these simply to follow the main thread.